Chinese people are fond of drinking soup and it is amazing the types of soup which they cook. 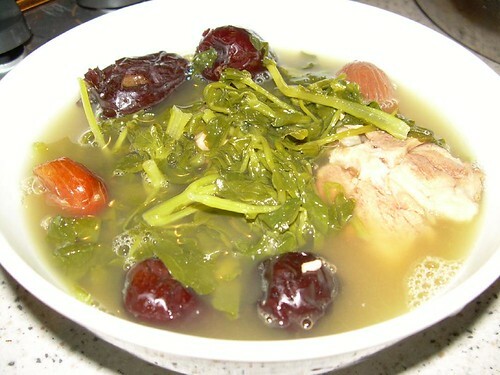 Part from meat based soup, vegetable based soup is also highly popular, including the use of leafy greens. One of the vegetables which can be used for a simple and quick to cook soup is the Q-chai. I have tried hard to look for the exact name for this vegetable but to no avail. Q-chai is the hokkien name for this vegetable. It looks like lettuce but it has a stem not unlike pak choy. If anyone knows the exact name for this vegetable, do let me know. In the meantime, I can only show you what it looks like prior to cooking. 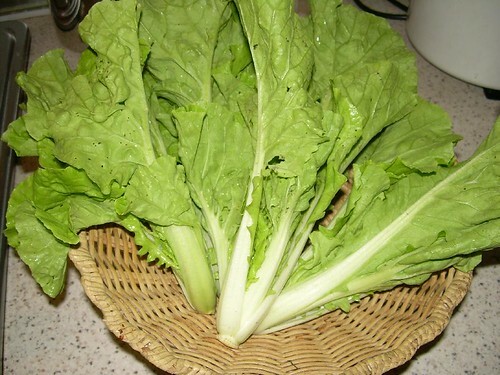 The stem is thinner than pak choy. 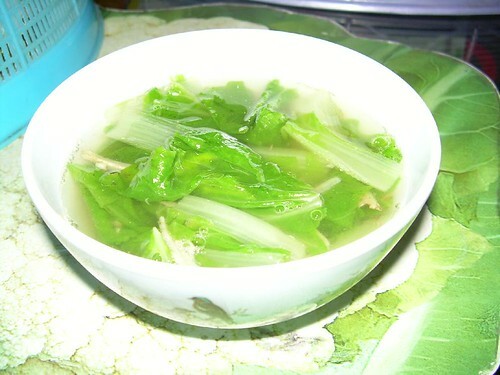 Old Cucumber Soup is a popularly available soup in Malaysia and Singapore – whether in Chinese homes or at eateries. Being an old cucumber, it is sold with a slightly thick and brown-coloured skin. Usually it is fatter than the young green coloured cucumbers which you get from the market. So, don’t go and buy some fresh cucumbers and leave it at home thinking that it will grow old that way. It doesn’t work that way. Just like most other soup recipes on this site, Old Cucumber Soup is VERY easy to cook and tastes great when paired with other great tasting ingredients like dried cuttlefish, dried scallops and red dates. Just prepare the ingredients and put them into the pot. Give it a simmer over 2 to 3 hours and you’ll get a hearty soup to drink. You can eat the cucumber flesh, which will usually be very soft to the pulp but I usually only go for the soup. Hairy Gourd is also known as haired gourd, fuzzy gourd, fuzzy squash, Mao Gua, Mao Qua, Mokwa, Mo Kwa or Hairy Cucumber. It is essentially a cucumber looking gourd which has dark green and short hair. Well, don’t worry about the hairy bit because you will need to skin the gourd and only use the flesh for this soup. And just like most of the other soups you find on this site, you can either use the slow-cooker / crockpot, charcoal stove, gas stove or electric burner stove to cook it. If you use the slow-cooker or charcoal stove, you will need to adjust the amount of water used. My usual rule of thumb is that if I want to serve one large bowl of soup, I will put in 1 1/2 bowls of water to cook it in a slow-cooker or charcoal stove and allow it to cook and reduce to one bowl. If I am using the gas or electric stove, I would put in 2 to 2 1/2 bowls of water instead. This is because water evaporates much faster in the gas and electric stove cooking. However, the funny thing is, if I want to serve 2 large bowls of soup, I would use not more than 3 bowls of water instead. It’s kind of hard to explain but it is just a habit I learn through cooking soup all these years. You just need to experiment and learn. One thing about cooking soup though, is not to add in additional water midway as it will somehow deteriorate the tastiness of the soup. 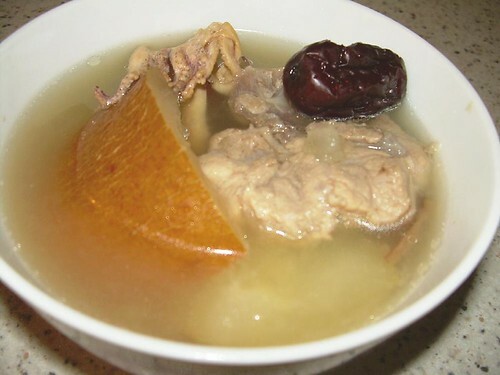 To cook this soup, I actually boil the meat (pork) for about 1 to 2 minutes and removed the scum appearing on the surface of the boiling water to get rid of potential “unpleasant” taste. The water is thrown away and the meat is then cooked into the soup. I prefer using bony pork parts (eg. 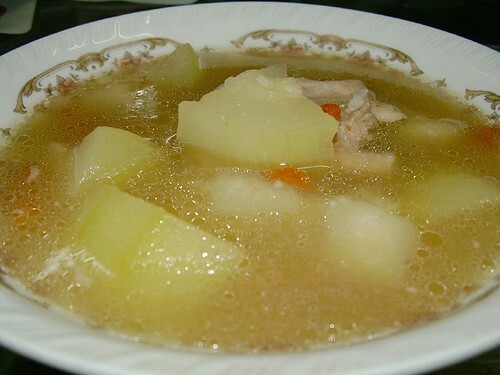 ribs, shoulder, back) for this soup but you can also use chicken parts. As for the watercress, I will pluck the tender shoots / stem with its leaves intact and discard the main longish stems. The shoots will shrink in size upon cooking by at least 70% in volume. Hence, you might have 3 soup bowl volumes of watercress shoots but upon cooking, you will be left with approximately 1 bowl or less.